When you read a book as a child, you hear the words and see the pictures, but you rarely grasp the story’s nuances or the author’s underlying intentions. Reread that same book as an adult—perhaps with your own kids—and the complexities and sharp edges come to light. 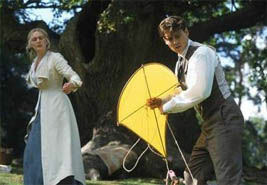 That’s what Peter Pan fans Johnny Depp, 41, and Kate Winslet, 29, experienced while making Finding Neverland, a film about playwright J. M. Barrie and his friendship with the children who became the inspiration for the world’s most beloved Lost Boy. Here, Depp (father of Lily-Rose, 5, and Jack, 2) and Winslet (mother of Mia, 4, and Joe, 11 months) share their private history with the classic tale and explain why they never want their own children to (completely) grow up. LIFE: What’s your earliest Peter Pan memory? JOHNNY DEPP: The Disney animated film. It’s a great little movie, but it didn’t have the full effect of the book. I didn’t read the book until much later, as an adult. Did anything stay with you from the movie? Depp: [Smiles] It was probably the beginning of my obsession with pirates. Kate, were you a fan of the Lost Boys too? 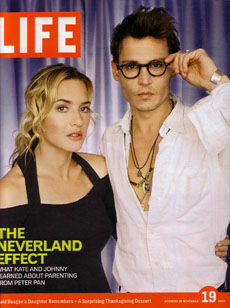 KATE WINSLET: I can’t remember a time when I didn’t know about Peter Pan. If you’re British, it’s much more a part of your heritage. I remember trying to leap off the couch when I was 8, and involving my brother. We really believed we could fly. There were loads of bruises. So what does Peter Pan mean to you now? Depp: Growing old is unavoidable, but never growing up is possible. I believe you can retain certain things from your childhood if you protect them—certain traits, certain places where you don’t let the world go. Winslet: It’s true. There’s a part of yourself that you can keep very much to yourself, for your own imagination, your own sense of fantasy. This film is very important because in today’s world, it’s harder for kids to do that. They’re exposed to monstrous things from a much earlier age. I took the train to school [by myself] from age 11. That would be unheard of today. How do you keep the magic alive for your kids—especially in today’s stormy world? Depp: You have to be honest with your kids about the world but also do your best to protect them. When I was a kid, we watched the Vietnam War on the six o’clock news, and it was desensitizing. You felt you were watching a war film: meanwhile you were really watching these guys getting blown to bits. Parents need to protect their kids from watching that stuff. Winslet: The only instinct you can have as a parent is to make sure your kids are happy and secure. But you can’t keep them in the dark all their lives. You can’t let them believe in Father Christmas until they’re 15. But when your child is younger, you still want her to believe in the tooth fairy, right? Depp: You want to protect their right to be children for as long as possible, because it all goes by so quickly—more so today than when I was a kid. Do you try to protect your children from your fame? Depp: What’s very confusing for them is why there are people who want to take Mommy and Daddy’s photograph. So we have a little game where we hide our face in Daddy’s shoulder. When we get in the car and we’ve passed all the photographers, then we can bring our face out. They don’t need to be exposed to the absurdity of that frenzy. Lily-Rose asks, “Why do they want to take your picture?” My answer is always the same: “I don’t know.” Because I don’t. Winslet: For me, this whole predicament is interesting because Mia lives with me and her stepdad [director Sam Mendes] and not her real dad . . . That is private . . . it certainly isn’t something I want her to read about in the papers. What scared you when you first became a parent? Winslet: I had a panic because I suddenly thought, “God, I don’t know any nursery rhymes.” Of course I did, but they get buried under the crap life deals you. After a few months, it comes flooding back. When you have children, you become a child again. You have to get back in touch with the child in you to communicate with your kids and understand them. In the movie, Neverland is, essentially, a metaphor for Heaven. Describe your Neverland. Winslet: My Neverland is where my family is—where I am happiest. Depp: The idea behind Neverland is, from your imagination make your dream life. I don’t have to close my eyes to see it because I live with it every day—with my kids, my girl, and my life. It’s as perfect as it could possibly be. Come this December 27 (2004), Peter Pan will have been refusing to grow up—and getting away with it—for 100 years. He first sailed through the Darling children’s bedroom window in the London premiere of J. M. Barrie’s stage play, Peter Pan, or the Boy Who Would Not Grow Up, in 1904. But in the ensuing decades, that tale of three siblings who are spirited away to a fantasy world of pirates and pixie dust has come to mean more to us than just a night at the theater. Even if you’ve never heard of Mary Martin’s 1954 Tony-winning performance, seen Disney’s animated film, tolerated Stephen Spielberg’s Hook, or wondered about Michael Jackson’s Neverland Ranch, chances are you’ve been swept up by Peter’s leafy coattails. Maybe it was the first time you met a girl named Wendy (a name invented by Barrie) or rode to New Hampshire on the Peter Pan bus line. If you’ve been labeled commitment-phobic (“Peter Pan syndrome”) or been a fashion victim (thanks to the schoolgirl Peter Pan collar), you have Barrie to blame. Such spin-offs, knockoffs, and tinkerings would doom most tales. But the reason Barrie’s masterwork has cast such a long-ranging spell is that it explores those deep imponderables that, at one time or another, consume us all: Using Hook, the Lost Boys, and a little magic, Barrie grapples with such grown-up issues as what happens to the child within us, our awakening sexuality—even our own mortality. Barrie’s inspiration was his relationship with the five Llewelyn Davies brothers, whom he met in London’s Kensington Gardens in the late 1890s. The boys’ parents died young, and though Barrie eventually became their guardian, he couldn’t shield them from World War I (which claimed one brother) or depression (Peter, long burdened by being branded “the real Peter Pan,” killed himself in 1960). Like the fictional Peter, who couldn’t seem to keep track of his shadow, the play’s endless brand extensions gradually caused us to lose touch with its darker, more complex underpinnings. But Finding Neverland washes away the built-up layers of pixie dust. At once uplifting and devastating, the film delivers a Peter Pan made for our terrorism-scarred times. It reminds us, parents as well as children, that growing up means finding a safe and meaningful path between unstinting hope and reasoned skepticism. Which is why, when Peter takes off for Neverland—“second star to the right and then straight on till morning”—we’ll never hesitate to dive off the windowsill after him.